Is AT&T ending 2-year contracts? AT&T is finally killing off the two-year phone contract next month, according to an internal document leaked to Engadget. 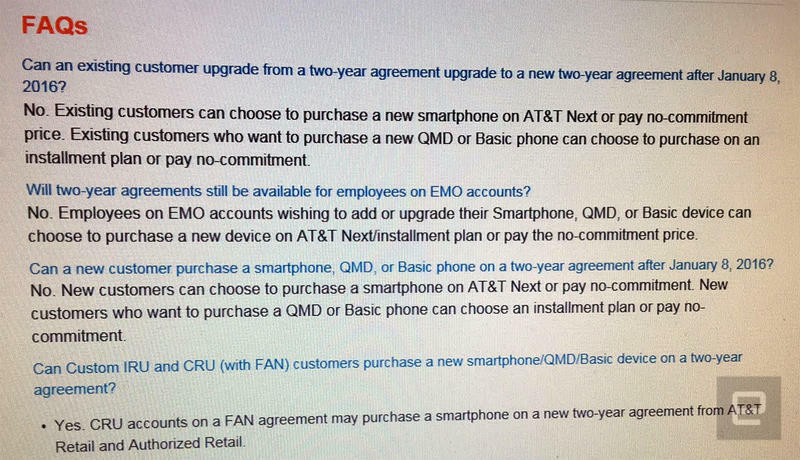 The memo, which was apparently sent out to employees on Wednesday, reveals that beginning on January 8 the carrier will only let you pay full price upfront or through a NEXT installment plan. With $0 down for well-qualified customers, the ability to upgrade early and down payment options available with even lower monthly installments, our customers are overwhelmingly choosing AT&T Next. Starting January 8, AT&T Next will be the primary way to get a new smartphone at AT&T. This does not apply to business customers under a qualified wireless service agreement. According to the leaked memo this move will cover AT&T’s entire lineup from the latest flagships to flip phones or any other “Quick Messaging” and “Basic” handsets. The one exception, which AT&T confirmed to TechnoBuffalo in the statement above, is corporate customers with a specific type of contract. It’s still unclear whether the change will affect how AT&T sells wearable devices. The carrier recently announced plans to offer some smartwatches on a two-year contract through its NumberSync service, which assigns the device the same phone number used by your smartphone. So it seems unlikely the company’s wearable program will change anytime soon.